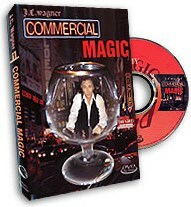 J.C. Wagner is considered one of the best bar magicians. This DVD captures his direct and stunning magic live and on location in his natural environment. Many of these routines have become staples in the repertoires of close-up magicians around the world. They are suitable for formal close-up or impromptu shows. You will also see the entertaining presentations and learn the many tips and ideas garnered from years of performance. The Card Under The Drink : This is the classic J.C. Wagner routine where selected and thought-of cards continually vanish from the deck and appear under a drinking glass that is in full view. Estimation Routines : Thought-of cards are found using the most devious methods in the arsenal of a card magician -- estimation, instincts and outs. Entertainment Tacks : J.C.'s card on the ceiling routine where the deck is wrapped with a borrowed bill and a rubber band. The signed selection and bill end up thumb tacked to the ceiling. Bandorama : A card revelation where the selected card spins out of a rubber banded deck. Poor Man's Matrix : A classic matrix routine using pennies and two kicker endings producing a large penny followed by a giant penny. Spectral Silk : Herbie the invisible Flea assists in finding a selected card while the cards are wrapped in a handkerchief. The handkerchief comes to life as the flea moves around as it finds the card. Dyslexic Queens : A card assembly with a kicker ending where the four Queens assemble in one packet and instantly vanish and appear back where they started. The World's Fastest Card Trick : A selected card is found in a quick and flourishy way using the Pop-Up Revelation. The Wagnerian Miracle : A spectator looks at a card in the deck. After the spectator cuts the deck a few times you name the position of the thought of card. Includes a memorized deck presentation and strategy. Would I Lie To You? : An easy lie detector routine where a card is found by spelling the spectator's answers to some questions which they can lie to. Also explained are the many techniques used within the routines. You will learn the Utility Spread Control, Pop-Up Revelation, Rhythm Count, Knuckle Jog, Snap Change, Two-Step Bottom Palm and much more.